On a mild Monday evening less than a week after Mardi Gras, 18-year-old Collin Craig was sitting in a downtown New Orleans hotel room talking to himself. He wasn’t having some sort of psychological episode; he was practicing an important speech. The next day Collin would stand on a stage in a giant exposition hall at the New Orleans Convention Center. Behind him would be a dazzling array of video screens, some projecting his image larger than life. In front of him would be a sea of 6,000 faces, all several decades older than him, and all quietly waiting to hear what this high school senior from Slocomb, Ala., had to say. Tuesday morning arrived, and Collin stood backstage in the green room waiting. The emcee called his name, music started playing, and Collin climbed up the steps and into the spotlight. He stood at the podium, and, reading from the kind of teleprompter that’s typically reserved for presidents, told the crowd gathered for the 74th annual meeting of the National Rural Electric Cooperative Association (NRECA) about the journey he’d taken in the past year. A year earlier, Collin had been selected by Wiregrass Electric Cooperative to participate in the 2015 Electric Cooperative Youth Tour. Every June, nearly 1,700 students from electric cooperatives across the country, including 134 from Tennessee, converge in our nation’s capital for the Youth Tour. Students spend the week visiting monuments and museums, meeting Senators and members of Congress from their state, learning about leadership and the cooperative business model, and forging lifelong friendships with fellow Youth Tour participants from far-away places who were strangers just a few days before. Each of the 44 states that participate in the program selects one member of their delegation to represent it on the Youth Leadership Council. Members of the council come back to Washington for additional leadership development experiences, serve as youth ambassadors at events hosted by their state’s electric co-ops and represent their states at the annual meeting of America’s electric cooperatives. The Youth Leadership Council elects one of its members to be the group’s spokesperson and deliver an address at the annual meeting. Last year, they selected Collin. When he concluded his remarks, he was given a standing ovation and NRECA President Mel Coleman praised Collin and his 43 fellow members of the Youth Leadership Council. Though Collin was the man in the spotlight at the annual meeting, all Youth Leadership Council members are leaders in their schools, communities and extracurricular activities. Shantelle Des Marais, a freshly minted high school graduate from Pipestone, Minn., is one of them. As a three-sport athlete and competitive dancer, Shantelle keeps a busy schedule. Though she is active in her community, coaching children enrolled in beginner gymnastics and track programs at the local rec center, she had never really paid attention to politics. Last year, she saw a flyer for a program sponsored by her local electric cooperative, Sioux Valley Energy, called EmPower Youth Leadership. She talked to her school counselor and applied for the program. After completing the program, she was selected to be a member of the Minnesota Youth Tour delegation, and was later chosen to be the state’s Youth Leadership Council delegate. Her experience with Youth Tour and the Youth Leadership Council inspired the 18-year-old to get involved in her first presidential election. Not only did Shantelle caucus for the first time, she was selected to be a county delegate. “The best thing about this whole experience is that it has opened my eyes to different possibilities,” she said. Another young woman who participated in this eye-opening program was Emma DeMaranville from Tonganoxie, Kan.
Emma was familiar with her local electric cooperative, but had no idea how many different types of cooperatives there are and the impact they’ve had throughout the U.S. and the world. Her grandmother had seen the opportunities other students had gained through the Youth Tour program and urged Emma to apply. An active member of Family Career and Community Leaders of America who also participates in forensics, debate and theatre, Emma was selected to represent Leavenworth-Jefferson Electric as a member of the Kansas Youth Tour delegation. One common theme mentioned by all three of these young leaders was the need to cooperate, be respectful and find common ground to solve problems. Collin recounted the many spirited conversations he had with other YLC delegates on important issues. “There were times when we might have different opinions, but there were never any fights, rivalries or hatreds. In fact, we used these debates to strengthen each other. We learned how to unite. Diversity doesn’t cause adversity, it can demolish it,” he said. All three of these students plan to attend public universities in their home states this fall, and say the experiences they’ve gained over the past year have influenced what they’ll study and how they plan to live their lives after college. “If you had asked me a year ago what I wanted to do with my life, I would’ve said ‘I don’t know. Probably something with computers.’ I still plan to major in computer science, but that’s just the foundation for many different things Youth Tour has inspired me to pursue,” Collin said. 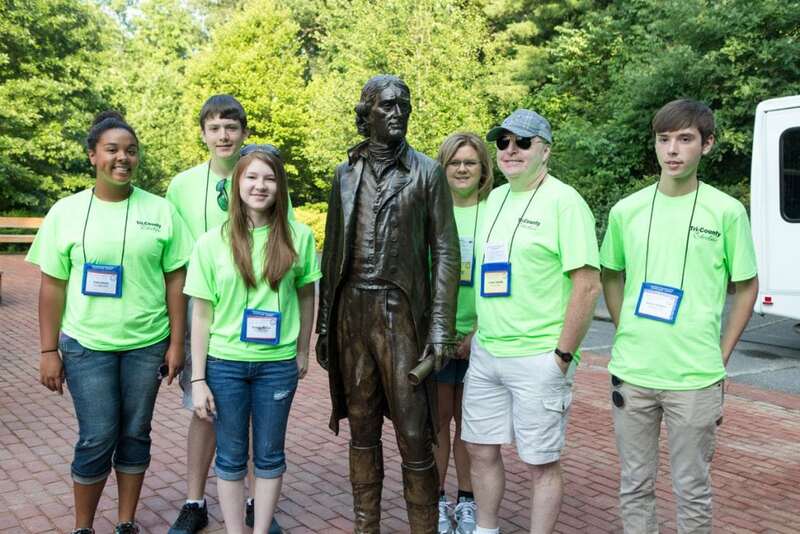 Youth Tour is a joint investment made by your local electric cooperative, the Tennessee Electric Cooperative Association and the National Rural Electric Cooperative Association. When Youth Tour participants arrive in Washington each June, the expectation is that they will learn from our political leaders and be inspired to do great things in their communities. Based on the wisdom and maturity displayed by Collin, Shantelle and Emma, our future is certainly bright, and our current elected leaders could learn as much from the students as the students learn from them.